Father Peter Loy Chong was this morning ordained as the Archbishop at the Vodafone Arena in Suva. The principal consecrating bishop emeritus Petero Mataca and two other bishops conducted the ordination service. Mataca told Archbishop Chong not to forget the less fortunate at the time of his service. Mataca was emotional after he blessed Archbishop Chong today. Archbishop Chong told the more than 15,000 people present at the Vodafone Arena today that he will do his best. 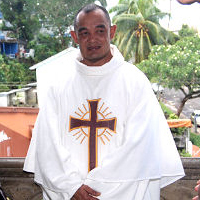 He will also look after the Archdiocese of Rarotonga and Kiribati. Archbishop Chong will be installed at the Sacred Heart Cathedral tomorrow. The President Ratu Epeli Nailatikau, the Prime Minister Commodore Voreqe Bainimarama, Attorney General Aiyaz Sayad Khaiyum and other dignitaries joined parish members to witness the historical event today. The last ordination was held in 1974. One Response to "Archbishop Peter Loy Chong"
CONGRATULATIONS ARCHBISHOP PETER LOY CHUNG!